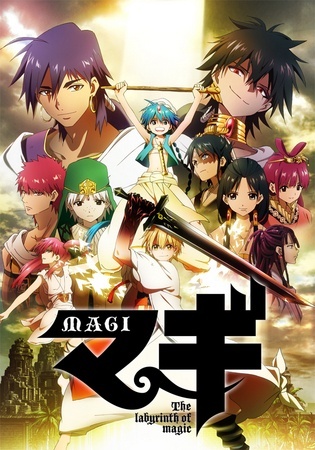 Magi is the story of a boy named Aladdin who embarks on an adventure to raid mysterious dungeons that have popped up over the land as well as find out who he really is. Along the way he encounters many different characters but his first encounter with a boy named Alibaba. 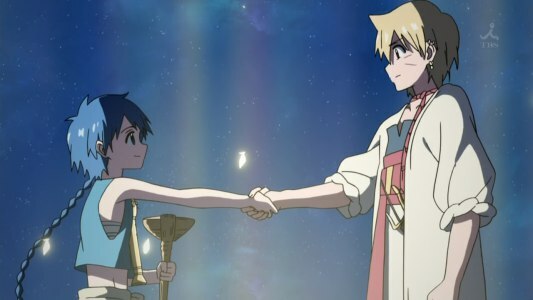 Aladdin and Alibaba become best friends with a common goal of raiding dungeons but as the story progresses become their relationship becomes that of destiny. The anime is on its 13th episode of its second season. The first season being named the Labyrinth of Magic. The second season named Kingdom of Magic. 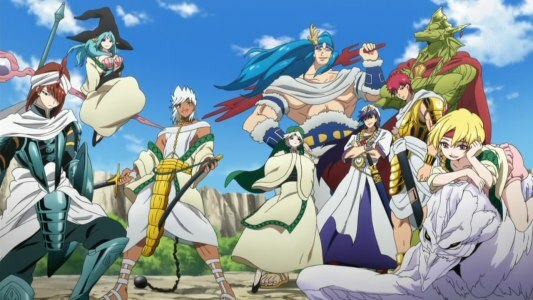 The following are my thoughts on this weeks anime Magi. This anime has been on my list of animes to watch for awhile now. I have kept passing it up as I thought it wasnt going to be my cup of tea and wanted to watch other anime first. At first glance you think its just going to be one of those goofie kidie animes based on the pics and info, but I came to find out I was wrong and this anime has a lot to offer. Its different then most anime as it has more of a middle eastern mytho rather than Japanese. The first 9 or so episodes of the anime are like the building blocks for what is to come. While these episodes are not the best they are still entertaining to watch. Epsiode 10 is where things take a turn and this anime gets deep. Powers start to come out, the bad guys take root, and the plot takes a turn into a more darker tone. From this episode on I have been highly entertained with this anime. I can’t really explain things without spoiling the plot points, but the characters, the plot points, the fighting, the magic introduced from this point on is sure to take you on an enjoyable ride. You will be on the edge of your seat trying to figure out what’s going on, why are these people are doing this, who is this person, etc. This anime was a pleasant surprise and I’m glad I didn’t make the mistake of passing this up. This anime like stated above is on its second season and in two days from me writing this will be airing its 13th episode. To check out the past episodes and keep up weekly with current episodes on Crunchy Roll, Hulu Plus, and most likely anywhere else you get your anime from (wink wink).